I also started using this today. Very nice. However, I often work pretty odd hours (and sometimes even more than 12), so I don't really like the limitations on Start Time (6-10) and Hours Today (8-12). Also, I would personally prefer a delete confirmation (or an undo) - an errant click could easily wipe out a task. But thanks for a very useful piece of free software! Looking forward to using this--I'm still using the original desktop app. Brilliant. It's simple, super easy and on top of that exactly what I need. If you plan to make it multilanguage I can help with russian localization. Really nice, but why do you use 0.25? I understand that this is percents, but why not to use 15min? Thank you for this useful tool, A feature i would like to be added is an hourly rate input box so it can automatically multiply by the billable hours. Again thank you for sharing!. Very nice, would like a settings option to change the chime interval. Would also like an tag that allowed time recording in 5 min period's, bubble broken into 3 sections, each color-able separately. Means that 25min time periods with breaks can be recorded. A setting on this tag that is set to overlap no, will cause any other filled 15min time bubble in the same time period to auto break into sections, with the other sections colored. Absolutely amazing. I wish I could write such wonderful programs. I've been using it the last couple days and like it a lot. I like the visual display of your time and I like the 15 minute chime as a reminder. The ability to move columns around is nice (eg. moving the Totals column next to the Task Title for easy reference). Though I noticed a bug that if you make a column move that affects the placement of the Task Title column (like moving Total before the Task Title), when you add a new task the Task Title column is no longer editable, but the one put in it's place. It looks great. I'll give it a shot. Thanks for sharing! Hi! Thank's for programm! Is it possible to add more hours to the schedule? I need about 16. 3) Some means of alloting the time for each task beforehand could have been very useful for planning the day. Once again thank you very much for a great app. Been using this a few days now and I would really like to see earlier start (5am) and more hours. I am trying to work, leisure and study so I can fine tune my time planner (budget) for the 3 commitments. Currently I add a line called everything below this is +5 hours :-) The hashtags are useful but once you get beyond a certain limit the task timers width starts stretching inelegantly. Otherwise I like it and the 15 min chime is great to keep me mindful about what I should be doing now (not procrastinating!). Thanks good app. Thanks for this App. I especially like the hashtag feature, as well as the 15-minute chime. I don't know if you are planning on spending any more time on this project, but I second Todd's request for the ability to set a longer work day, as I sometimes work a morning/evening schedule, taking the afternoon off. In aany event, thanks again. Sorry for the delay in responding and publishing comments... :-/ It was a really busy month! Thanks for the feedback. There's a new version 1.0.5 available. Clinton - thanks for the app. I used it one day and already recommended it to my team half way through the day I found it so useful. My comments are the same as some of the other people’s here. 2) Allow for 24 hour day as I often work split shifts where I put in a few hours, take a few hours off and then work a few more hours. Everything else worked so smoothly and I was able to fill in my time sheet much more accurately because I used the hashtags and it totaled up my time for each hashtag so nicely. 2. Allow for 24 hour day as I often work split shifts where I put in a few hours, take a few hours off and then work a few more hours. I've been using this app ever since it was released and it continues to do a fantastic job of helping me track my activities and stay focused. I've received a bunch of comments from coworkers wondering what it is and just today one of them decided to use the app himself because he said he needed to start getting real work done. Kudos! I like it and have recommended it to several friends, but wanted to second the comment earlier regarding the limitation on the start time. I am a freelancer and it's not unusual at all for me to start working 11am, 12, 1, 2, or 3... It would be handy not to have to start every day at 10. I'm not sure if I have a buggy installation or if it doesn't work on Windows 8. 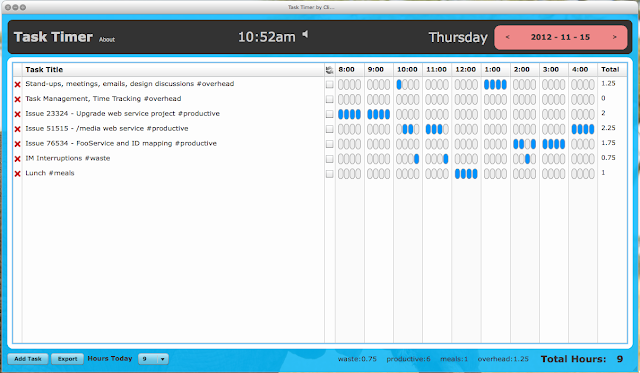 I enter tasks and the when I move to a different day or close the program, everything disappears. I looked in the folder in C and it is empty. Hey I have been using this task timer for the past 3 months and it's worked for me amazingly. 1) when I set the sound, I'd like it to remember it the next time I open it. Specifically, I keep it off always, because the ding makes me jump in my chair. I switch it off everyday when I start. I'd like to switch it off permanently. 2) The export property saves the over all conclusion of time used. But I'd like to be able to save the info from the bubbles as used as well. So I can analyse my time used and my break cycles at a later stage. In any case, it's great.Thanks! Thank you Dave Seah, its a great idea! Super work Clinton! brilliantly done! thumbs up! This is a great app! Any thoughts of Open Sourcing this? I would really like to be able to export more than one days worth of time tracking data at a time. Or is there some other way to read these .tasks files? Thanks for this! Please make it open source, I'd love to tinker. Downloaded AdobeAIR.dmg and TaskTimer.air, but when I try to install the TaskTimer app, I am presented with: "The application could not be installed because the installer file is damaged. Try obtaining a new installer file from the application author." Any suggestions?